I have this doll and she is in perfect condition. She has never been taken out of the box at all. I can't seem to find her anywhere. I need help in finding out her value. These are mass-produced dolls. I would say the value is $10 or less. NUMBERS ON THE DOLL,NAMES.IT REALLY HELPS IF YOU HAVE THE MANUFACTURER OF THE DOLL,GO TO DOLLREFERENCE.COM. THEY HAVE EVERYTHING YOU NEED TO FIND THE WORTH OF THE DOLL. If I remember correctly, this line of dolls was exclusively made either for Kmart or S. S. Kresge or Woolworths back in the 1980s or early 1990s. I hope I am remembering right as I don't want to lead you down the wrong value path. Is there a UPC symbol on the box? Sometimes you can get an exact year and more info from looking that up on a UPC tracker online. If this is from that series, some of the dolls in the series fetch up to $30 online, but most fetch between $5 and $10 if they sell. They were mass produced dolls that did not sell for much new which in most cases keeps their value down today. These dolls were--to those of us who sold the expensive ones in Hallmark and other more upscale stores--considered "knock offs" at the time, and were frowned upon by the upscale sellers as inferior. Sales staff like me were taught how to talk up our dolls vs. the "cheap" dolls, so we would not lose buyers to the discount shops in the same mall or shopping center. The thing with these is some people bought them and the kids played with them, so unlike the expensive dolls sold, some of these do have sentimental value where someone wants back a doll of their youth, so this can sometimes give them more value in today's open market. Because you can't find an exact match to yours, it probably means she was one of the ones who was played with and didn't survive play, so there aren't many out there. That may be beneficial to you. The flip side to not being many out there is that the owners are still unearthing their massive doll collections and just haven't gotten to her yet to sell. Like you, I can't find an exact match to her online either, which a sold version would give me today's actual market value. Sold auctions to me are the only way to determine an ACTUAL value. Anything else is a guesstimate or what you want to get from it. All this said, if you are in the market to sell her, you can try starting her in the $50 range and take best offer, which may be low...but I say start high and work down. If you are not an expert at selling dolls on line, post back and I am happy to give you some tips. Selling dolls on line offers some special challenges. Post back and let me know how the sale goes! 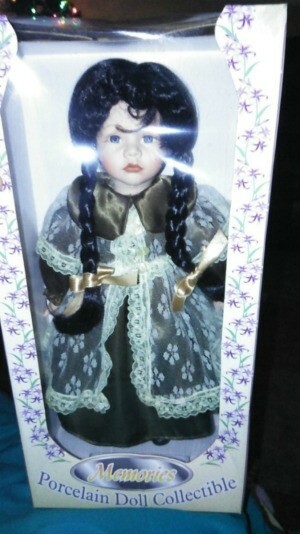 There were several dolls produced with similar names and some brands are still being made. These dolls were made under the names: Adorable Memories, Hearts & Harvest Memories, Memories, and Collectible Memories. The only brand that has retained any value are the Collectible Memories and most of them are selling for under $35. The other brands hardly sell at all and if they do the selling price may be under $10-$15. The Memories was the least expensive of all these brands and some were even sold to service stations were they were priced at $15 or lower. Many were sold to drug stores, ToyBiz as well as the stores Pghgirl mentioned. You may be able to sell her on Craigslist for $10-$20 but I would not count on it as they are for sale at flea markets for $5-$10 and this is still the best time of year to try and sell dolls.